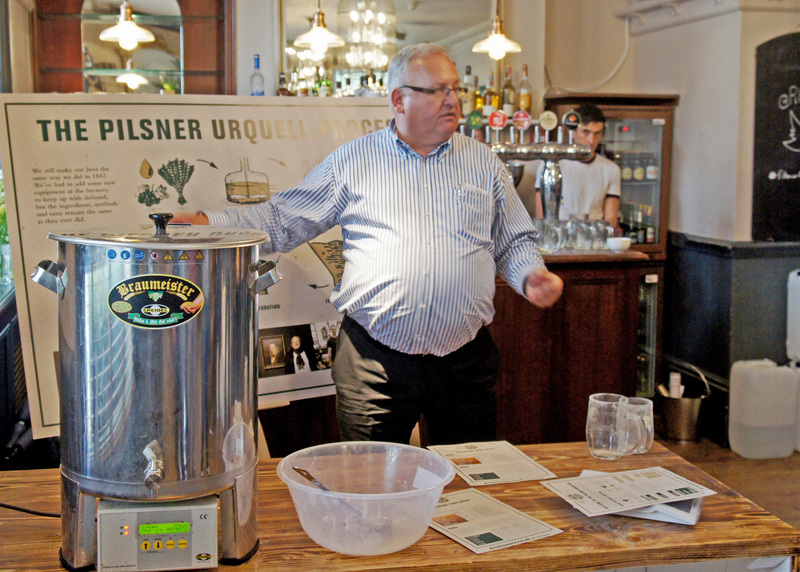 The event was organised by Pilsner Urquell, the invitation came from Mark Dredge, to whom I am extremely grateful for such a fun day, it was called the London Brew-Off, and it involved three teams of beer enthusiasts, each put in charge of a 20-litre Speidel Braumeister brewing kit, handed four kilos of ground Czech malt, pointed to bags containing a selection of other speciality malts and eight or ten different hop varieties, and told to think up a recipe for a pilsner that would be good enough to go on public sale, using those ingredients, and then brew it. Our raw, hopped wort would be cooled, then have proper Pilsner Urquell yeast added, and be taken away for fermenting and lagering and, finally, bottling. On Tuesday July 15, that is, just over six weeks later, all the lagers the teams had made will be test-tasted, and the best one will be put into full-scale production – 30 hectolitres, 5,270 pints by Windsor & Eton Brewery, ready for the White Horse’s Euro Beer Fest in September. First, though, we had a pep-talk from Václav Berka, senior trade brewmaster at Pilsner Urquell, on the secrets of PU: soft water from the wells of Plzeň, a triple-decoction mash that heats part of the goods in direct-fired copper vessels, where hotspots on the walls create caramelising in some of the sugars in the wort, which adds to the mouthfeel and flavour of the final beer, and Saaz hops added at the start of the wort boiling for bitterness and just before the end of the boil for flavour. We wouldn’t be able to recreate all of that – no decoction vessels, for a start – but this, Václav said, was our chance to follow in the footsteps of Josef Groll, the Bavarian who brewed the very first golden lager in Plzeň in 1842. 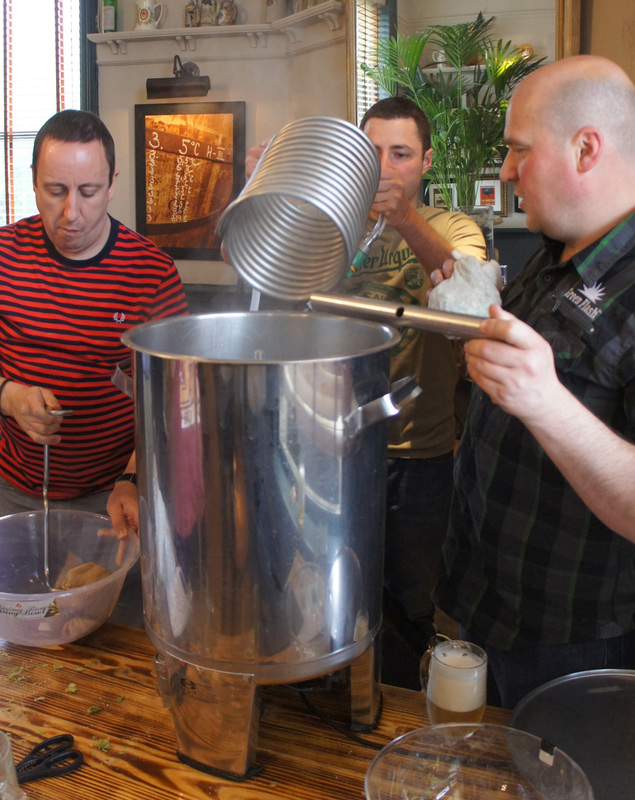 Finally we were divided into teams, told to put together a recipe using the available ingredients, choose a name for our lager and then start brewing. Fortunately for me, I was in an excellent team, with Andy Parker, a home-brewer of considerable experience and skill, and Justin “1970sBoy” Mason, and even more fortunately, we quickly discovered that we all had much the same idea about the kind of lager that we wanted to brew: something light and distinctly lemony. 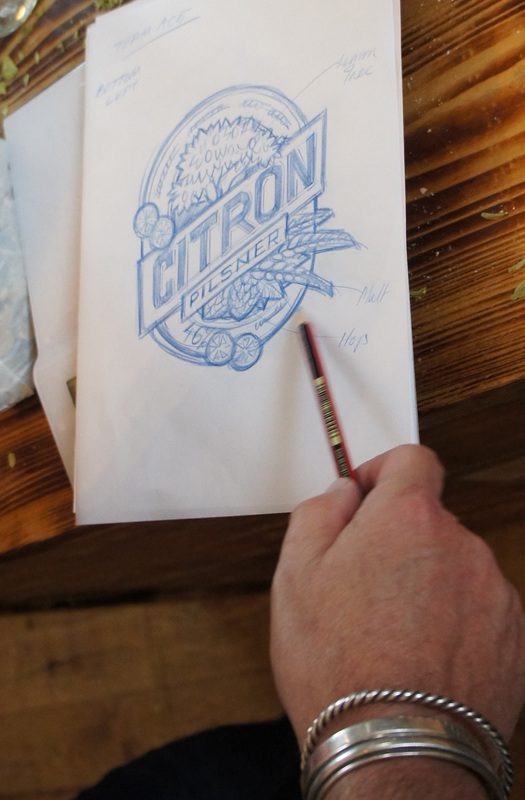 That gave us the name for our lager: Citrón Pilsner, after the Czech word for “lemon”. We had decided to use the traditional Saaz variety for our bittering hops, but to go for Kazbek, a medium-bitter Czech hop with lemon, grapefruit and spice flavours, added right at the end, and also some Sorachi Ace, the Japanese hop that also has a citrussy/lemony aroma, a pack of which Andy just happened to have about his rucksack, as you do. Unfortunately, Paddy Johnson, Windsor and Eton’s head brewer, who was also there, had to veto the Sorachi Ace, since a phone check confirmed that should we be lucky enough to win the competition, he would not be able to get hold of any for the scaled-up brew. So we went for the most light-fruit-flavoured hop we could find among those that Václav and his crew had brought along, Galaxy from Australian, a strongly bitter hop but with notes of passion fruit and peaches. These were to be added at flame-out, rather than, as is more traditional with a pilsner, five or ten minutes before the end, as we were looking for flavour and aroma rather than any more bitterness: because the Kazbek and Galaxy went in after boiling had stopped, we also raised the amount we were putting in by 20 per cent over what would be a “normal” amount of end-of-boil hops. Here Greg Tucker made an extremely useful suggestion: peach flavours, he said, drag lemon flavours “a long way back” in taste perception, so if we wanted the lemon side of the Kazbek hops to come fully through, we should ease off on the Galaxy. Our original plan for 25% of the final hops to be the Australians was therefore changed to 20% Galaxy against 80% Kazbek. The final hopped wort certainly seemed to have a lovely long finish, from the oats, and also the lemon notes we were looking for, though fermentation will change some of that: quite how, we will find out in mid-July. Paddy Johnson checked our OG: 1043.5, just the area we were aiming at. 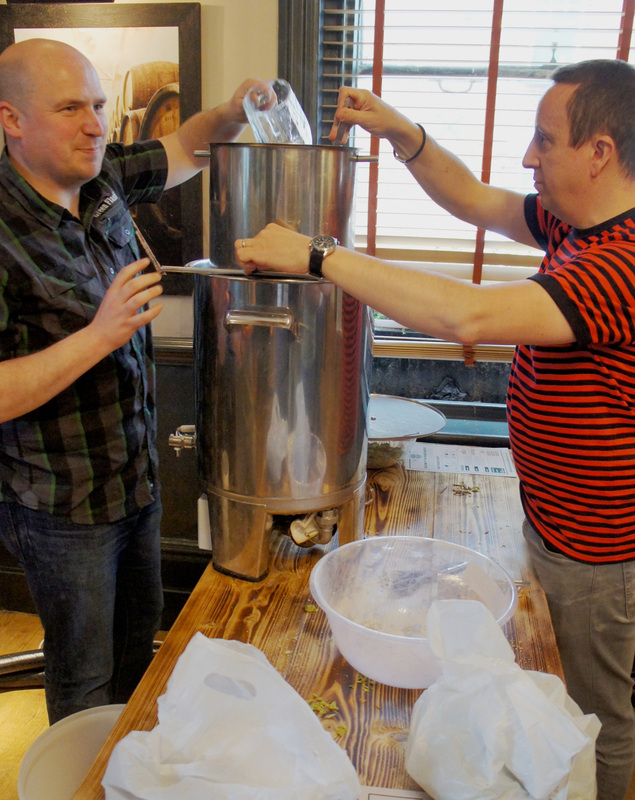 I was very impressed with the Speidel brewing kits, their “Russian doll” design, combining mash tun and brewing kettle, reminding me of the rather larger “Russian doll” brewing gear I brewed a wedding stout with at the former Pitfield brewery in Hoxton. At £1,250 a pop, though, you’d have to brew a lot of beer with your Braumeister to bring the cost per pint down to something reasonable. Still, I wasn’t paying: and I had a huge amount of fun. Apparently this is the first time PU has tried this sort of “interactive brewing” experiment/competition: it will be very popular if they roll it out as an event around the world. 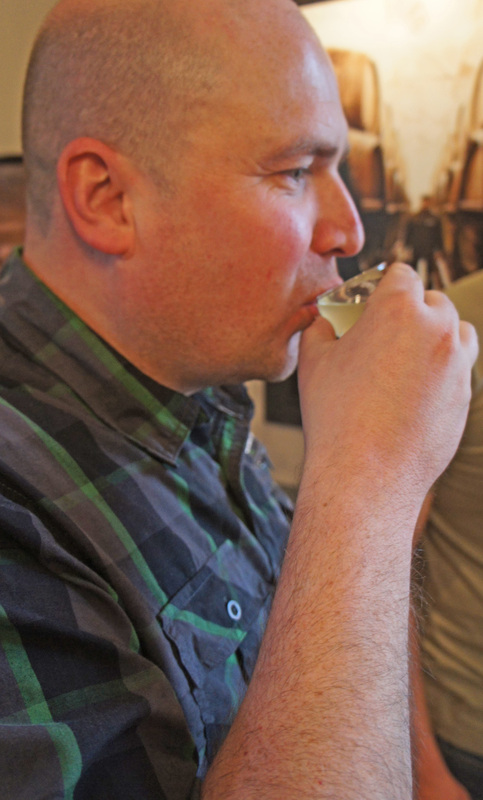 It will also be fascinating to taste our brew when it is finished: Peter “Tandleman” Alexander was on one of the other teams, and he’s a man, I suspect, who knows his way round a brewing recipe, so the competition will be strong. However, strangely, a beer I had some small involvement in has already won a competition to be brewed on a commercial scale by Windsor and Eton. Paddy Johnson asked the London Amateur Brewers to brew beers that would be suitable for commemorating the 800th anniversary of the signing of Magna Carta next year – the signing, of course, took place at Runnymede, near Windsor – with the promise that the best one would form the basis of W&E’s own Magna Carta anniversary ale, and one of the LAB, Manmohan Birdi, approached me for some historical advice. I suggested using ground-ivy and yarrow in the brew would at least be a nod to the sorts of herbs they might have used to flavour ale in 1215, Manmohan did that, and woohoo, his beer won the contest and will now be made and bottled at the W&E brewery. Very well done him. Great post Martyn. I’ll be doing something later today or tomorrow, but I doubt if it will have the detail of yours, so I’ll just refer to your blog for the nitty gritty and concentrate on what our little team did. Great day wasn’t it? Nice to (briefly) meet you mate! 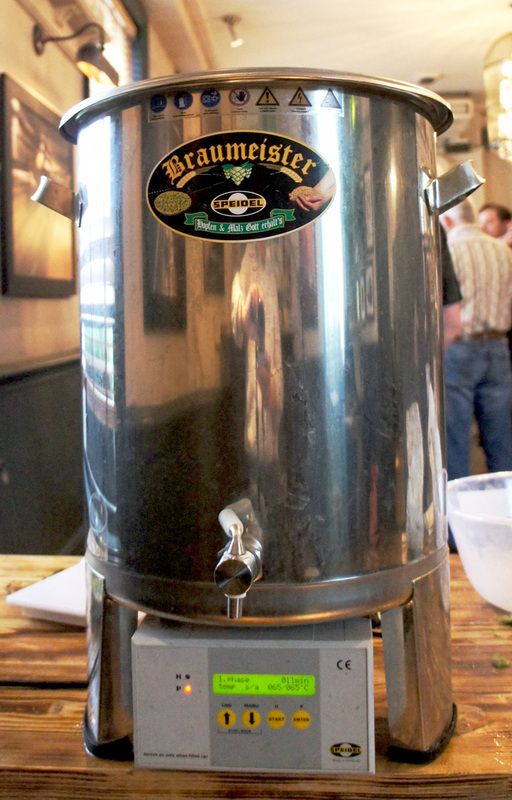 I use the 50L Braumeister, and yes, I too have paid less for a car, but compared to other all grain systems, traditional or new, the price isn’t that disproportional. Brewing equipment in general is pretty expensive.